The end of July is upon us and for small-scale producers of poultry, and consumers of chicken alike, the 30th cannot come soon enough. This is when Treasury is expecting the recommendations of the panel appointed to review the VAT zero-rated basket. “You cannot survive in this business if you’re not a contract producer,” says Clement Pilusa, an award-winning young poultry farmer from Onderstepoort near Pretoria. Despite running a farm with a capacity for 10 000 chickens and selling around 2 000 birds a week, success is tenuous for Pilusa. His customer base is mostly the informal market, where unstable demand makes for difficult production planning and management. Pilusa’s goal is to be contracted to produce for one or more of South Africa’s large poultry players. To get there, however, he needs investment for computerised chicken houses and access to abattoirs that meet international standards – just two of the boxes he needs to tick in addition to increasing his capacity and guaranteeing the quantities he can deliver. But the big players are not investing, given the pressure the industry is under. Relief, however, could come from an unexpected quarter if locally produced chicken becomes part of the basket of VAT-free food. Chicken is big business in South Africa. Poultry farmers produce birds by the millions and consumers buy the meat in vast quantities. South Africa’s chicken industry is a modern, efficient and internationally competitive business that contributes more than R50 billion a year to the local economy. It is also a major employer, with about 110 000 direct and indirect workers, while another 20 000 jobs in the grain industry depend on feed supplies to poultry producers. The poultry industry is in fact the largest component of the country’s agriculture sector, contributing some 18% of agricultural GDP in 2016, and 39% of animal product gross value. 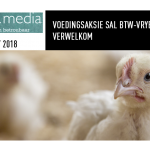 The “farm-gate” value of poultry production, including meat and eggs, was about R47 billion in 2016, with the retail value another R10 billion to R15 billion. In terms of consumption, food and non-alcoholic beverages is the largest expenditure category for lower income households. According to Statistics South Africa, it has increased from 18% in 2000/01 to 29% in 2014/15. The same data shows that chicken tops the list of the 10 food items on which lower income households spend the most money, and that poultry consumption per capita has nearly doubled in the last 28 years. These two sides of the coin form the basis of the FairPlay movement’s support for the campaign to include chicken in the basket of VAT-free foodstuffs. If the Treasury-appointed panel agrees, it will open the door for an innovative approach to use VAT zero-rating as an instrument for economic growth, in addition to poverty alleviation. 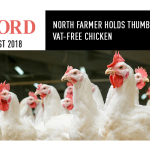 “The fact is, if we are smart about the VAT-free basket, Treasury stands to gain more as a result of economic growth than it would lose by zero-rating chicken,” says FairPlay founder Francois Baird. It is also one of the civil society entities advocating for the inclusion of chicken in the VAT-free basket. “Treasury is faced with the challenge of giving poor households VAT relief without robbing the fiscus of the revenue it needs for developmental goals to remain on the agenda – which was the reason for increasing the VAT rate in the first place,” says Baird. This appears an almost impossible balance to strike. But FairPlay believes it can be done with chicken as mechanism. Low-income households already favour chicken as their source of protein, hence a solid demand-side case exists that would only gather force once chicken becomes more affordable. Demand stimulates production, having a direct positive effect on the poultry production industry in terms of growth, investment, and job security and creation. “Locally produced chicken on the bone is arguably the only commodity that can achieve this double benefit,” says Baird. 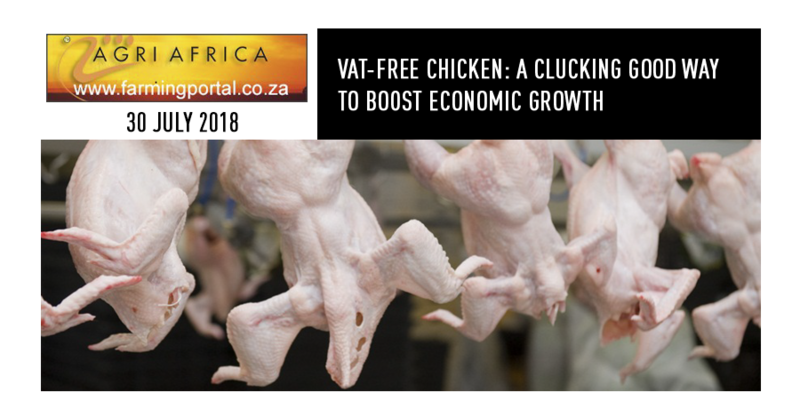 In its submission to the panel of experts reviewing the VAT-free basket, the South African Poultry Association (Sapa) estimates that zero-rating and the concomitant price decrease will result in a 7.8% increase in demand for chicken on the bone. • R80 million in additional household income for lower income households. “The Sapa submission clearly illustrates how beneficial zero-rating chicken would be for the country,” says Baird. The poultry industry is under severe pressure. It has already shed about 6 000 jobs and a number of smaller producers had to close down due to chicken pieces being dumped here by European and South American producers. Zero-rating chicken on the bone will give direct and targeted relief to poor households (more affluent consumers prefer boneless portions), as well as indirect support to an industry whose contribution to the national coffers specifically, and socioeconomic development and transformation in general, can exceed what Treasury hoped to achieve with the VAT increase. “South Africa has to meet its developmental goals to progress and flourish, and there can be no better way than to achieve this through fiscal policy application,” says Baird. One such developmental goal is rural economic development through agriculture. Currently, about 400 subsistence and small-scale poultry farmers, such as Pilusa, deliver 17% of the poultry industry’s total broiler production. In line with the National Development Plan (NDP), the government is already going to great lengths to introduce more small-scale producers into the poultry value chain in the interest of food security and rural development. “VAT-free chicken on the bone will give these initiatives a tremendous boost by encouraging private sector investment in addition to government support,” says Baird. It is equally important to note that stable and growing employment numbers will decrease thousands of households’ dependence on social intervention from government, placing them firmly on the road to sustainable self-sufficiency. “With all these facts on the table, the only possible conclusion is that the economic growth benefits of adding locally produced chicken to the VAT-free basket can far outweigh the loss of VAT income,” says Baird.